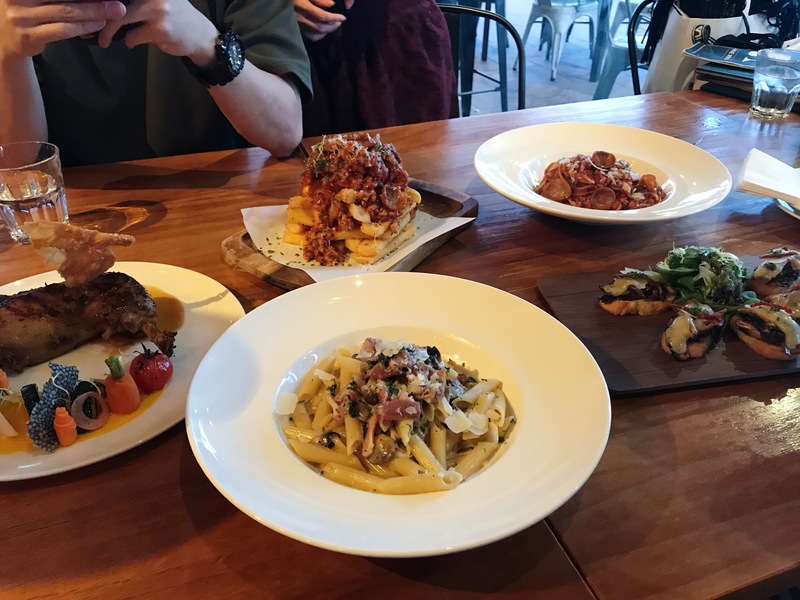 If you’re looking for yummy modern Italian cuisine, consider heading down to one of Supply & Demand at Esplanade. We visited the restaurant and rooftop bar, and greatly enjoyed the food and service. We sampled several of their dishes, and here’s the verdict. 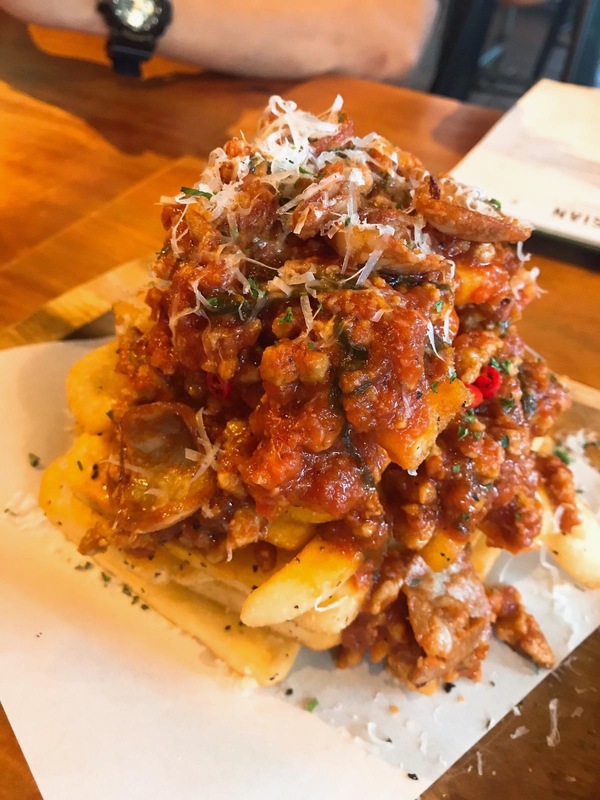 The Arrabbiata fries are presented stacked beautifully, with a grating of cheese on top. The Arrabbiata fries are a new addition to the Supply & Demand menu, inspired by the popular pasta. For those that want the signature flavour of Arrabbiata pasta but don’t actually want to eat the pasta, these fries are a great option to try. The fries were freshly fried and crisp, well-complemented by the tangy sauce and little pockets of minced meat. The portion is also generous, so this is a great appetiser to share with your friends. Another appetiser you may want to consider getting is the Mushroom and Gruyere Crostini, little bite-sized pieces of flavour. 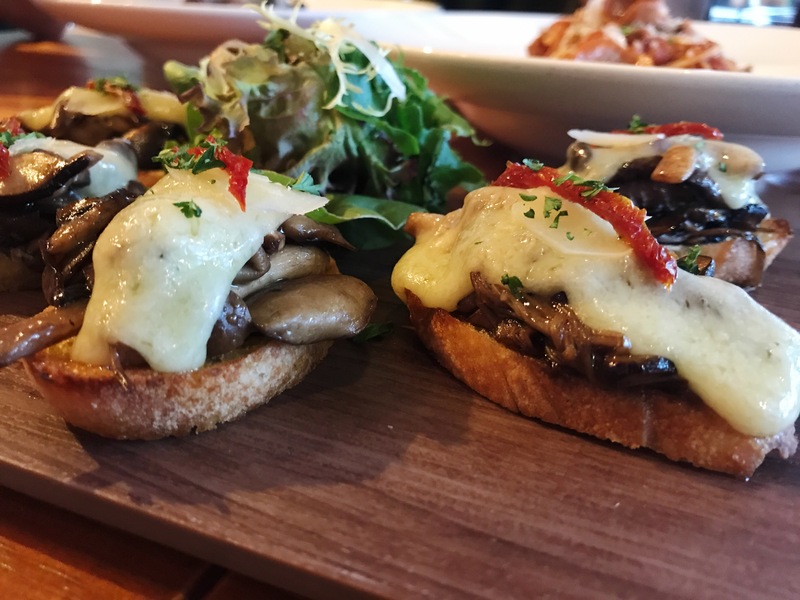 The Mushroom and Gruyere Crostini: garlic bread topped with sautéed farm mushrooms, topped with Gruyere cheese and oven baked. This platter costs $14. The bread is garlicky and crispy (not soggy at all, thank heavens), and upon biting into it there is a burst of flavour in your mouth. The mushrooms are cooked to perfection and add essential flavour to each bite. The gruyere cheese adds a lovely smoky cheese hint that’s strong but not overwhelming, complementing the other ingredients well. Although the portion may look small, it’s actually quite satisfyingly filling, so you’re getting your money’s worth. 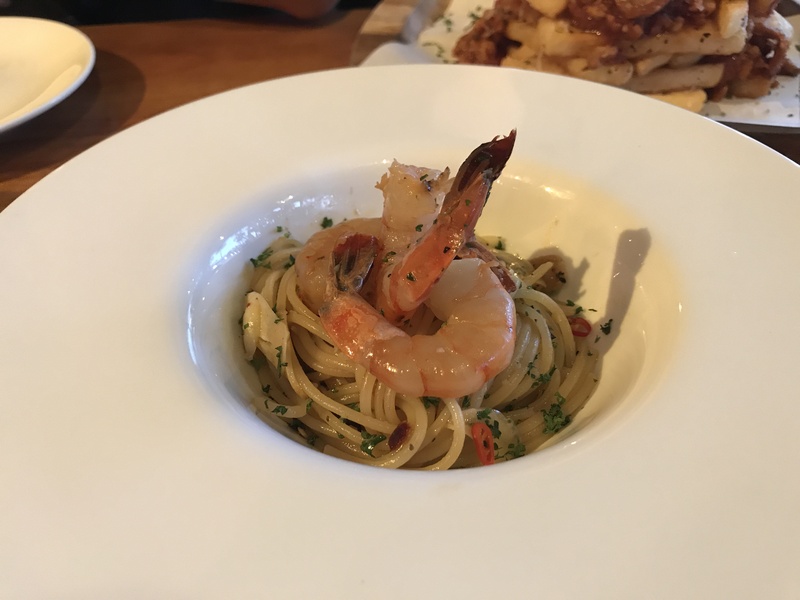 If you’re craving aglio olio, the classic olive oil-tossed pasta, the one served here at Supply & Demand is everything an aglio olio should be. The dish is well-balanced, with the garlic-and-oil taste, with the slightest kick from the chilli. What’s interesting about this restaurant is that they offer their many pastas in ‘Tasting’ portions. For lower prices, you get a smaller amount of pasta. This is beneficial if you’re (a) not that hungry, and (b) if you’re sharing food with your gal pals, and don’t want to have to finish a huge portion of pasta. This allows you to try as many dishes as possible without getting suffering an overly-stuffed tummy! Regular tomato pastas can get boring. But this is a little twist from the plain tomato pasta sauce we’re used to. 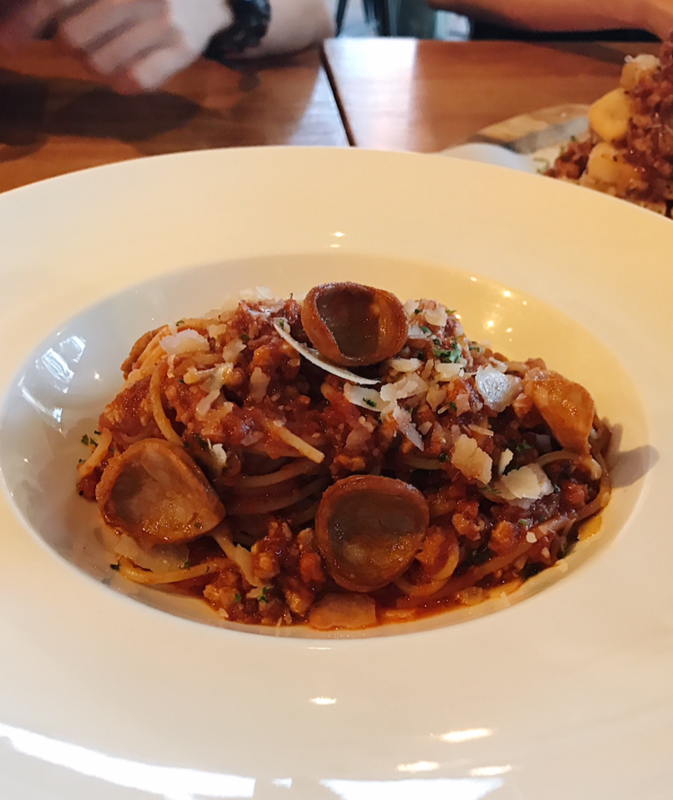 The arrabbiata pasta has a fiery hot garlic infused tomato sauce, minced pork, and pork chorizo. We’ve tried the fries, and also the pasta. Needless to say, both were good. Supply & Demand’s Arrabbiata Pasta. As promised, it has a slight spiciness that lends a nice kick to the pasta. The flavours all combine really well with the tangy tomato sauce and hints of cheese. Every strand of noodle is also coated with the sauce. The Pancetta E Funghi was served as a penne pasta, with the creamy sauce infused with Parmesan cheese, served with mushrooms and bacon. Especially if you’re a fan of cream pastas, this is a must-try! This was one of the nicer dishes and the cream was thick and flavourful, but not too heavy at the same time. The Parmesan infusion also brought it to another level, giving the pasta an overall creamy and smoky taste. For those that are more daring and adventurous, this is a menu option you should most definitely try out. Carte Blanche is essentially when you pick the meat, and the chef gets full liberty to cook up the dish in whichever way he (or she) chooses. So you won’t know exactly what you’re getting until it arrives at your table. The meats on offer range from the ubiquitous chicken, to US prime ribeye and lamb from New Zealand. We got the chicken ($20) and it was so beautifully plated. 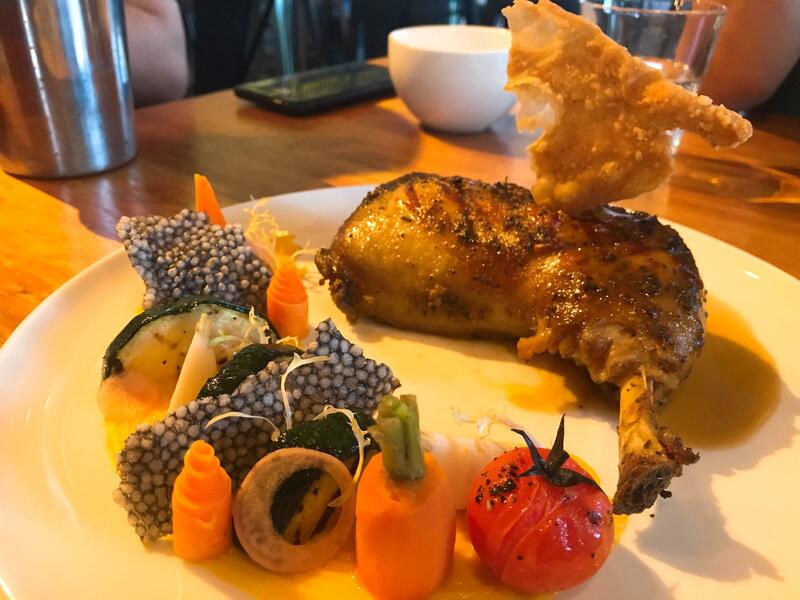 The chicken came grilled, served alongside carrot puree, grilled tomato on the vine, a fried chicken skin tuile, sago squid ink tuile, and pickled carrot and zucchini. The chicken was cooked well and had the right texture, not dry at all but moist and firm. The herbs used in marinating were apparent throughout the meat as well. This was also one of the tastier dishes and it was thoroughly enjoyable. We were intrigued to try the tuiles- the fried chicken skin one tasted light and almost nutty, not what you’d expect from fried chicken skin. The sago squid ink tuile didn’t have a strong taste- it was akin to eating a chip. This dish is highly recommended. Just head down and try it! If the meat is not to your liking, the staff are very friendly and will help you accordingly. 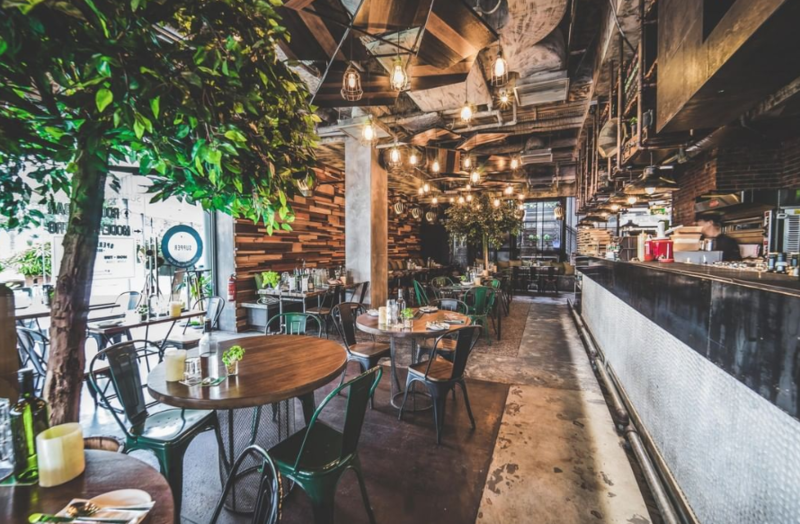 If you’re coming by for a brunch with your friends, this is a great option. 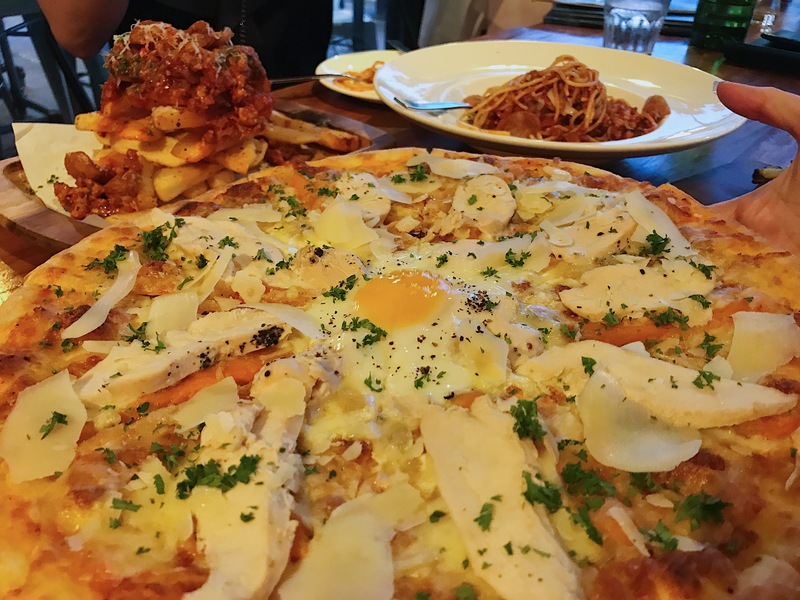 The thin crust pizza is very palatable, and comes served with an egg on top. The yolk is runny and for lovers of runny yolks, it’s a novelty breaking it every time, watching the golden yellow ooze out. You might think that a pizza with just cheese and chicken runs the risk of being bland, but the strong taste of the Mozzarella and Gorgonzola cheeses elevate the pizza into cheesy goodness. Coupled with the runny egg yolk, it’s quite an enjoyable pizza. The sweet potato strips are almost like pleasant surprises as well. Such pizzas are amazing because you can essentially sample two different pizzas for the price of one. You’re not limited to only choosing one flavour! It’s something you should most definitely opt for. Can’t decide between two pizzas? Why not get both? 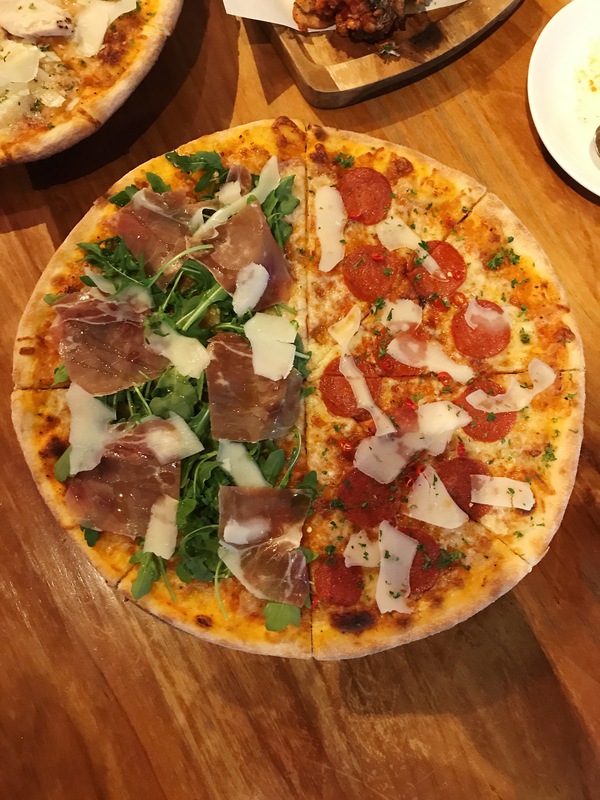 The Parma Ham half is topped with tomato sauce, mozzarella, parma ham, Rucola salad, shaved Parmesan cheese, and drizzled with olive oil. It’s a simple but the flavours go very well together- the salty goodness of the Parma ham is balanced with the nutty rucola (which you might also call rocket or arugula) and the dough. 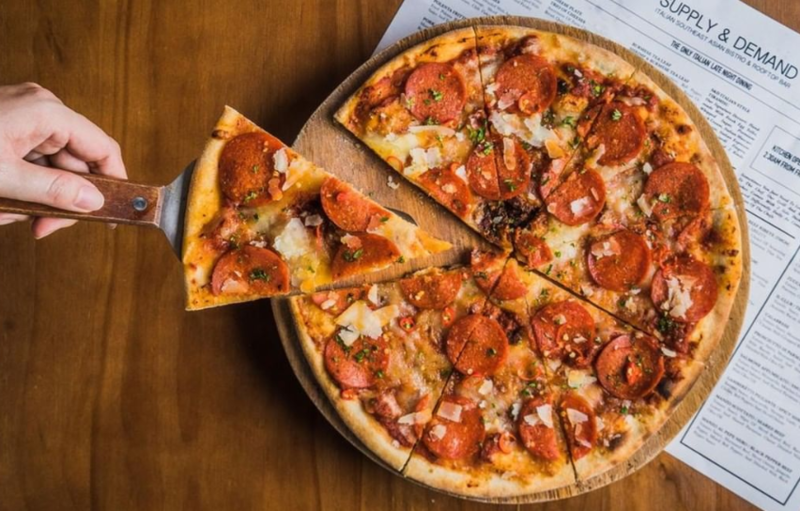 The pork salami half looks a lot like pepperoni, but it’s a great alternative. The pizza is cheesy and meaty, but not overwhelmingly heavy. Liberal sprinkles of chilli inject a nice complementary spice that take the pizza up a notch.